ePublishing Knowledge BaseePublishing Knowledge BaseePublishing Knowledge Base User Profiles and Registration FormsHow do I add a subscription to a reader's profile? To add a subscription to a reader's profile on the back-end of your website, follow these instructions. Adding a subscription record to a reader's account will grant that reader immediate access to the subscription product, as long as the Begin Date and Time for the subscription are set correctly. Open the reader's profile in the User Manager. 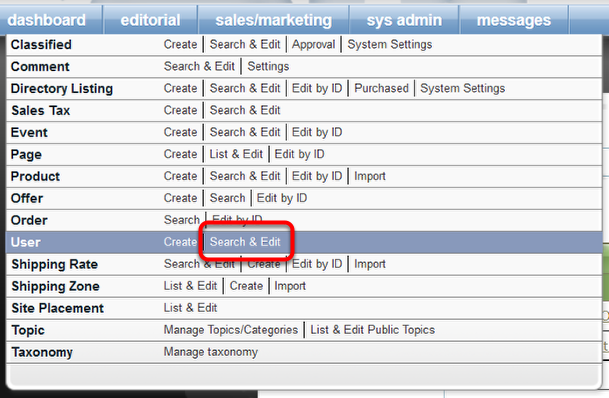 To find the reader's profile, click Search & Edit next to User under Sales/Marketing in your dashboard. After finding and opening the reader's account, go to Edit > Subscriptions. Set up the subscription under the 'Create a subscription' section. 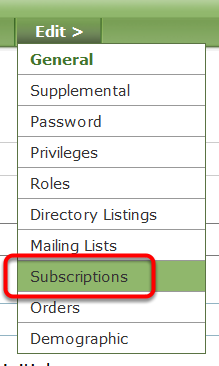 Click the dropdown to select the subscription type (1). The next field (2), if applicable, will update or disappear based on your selection. 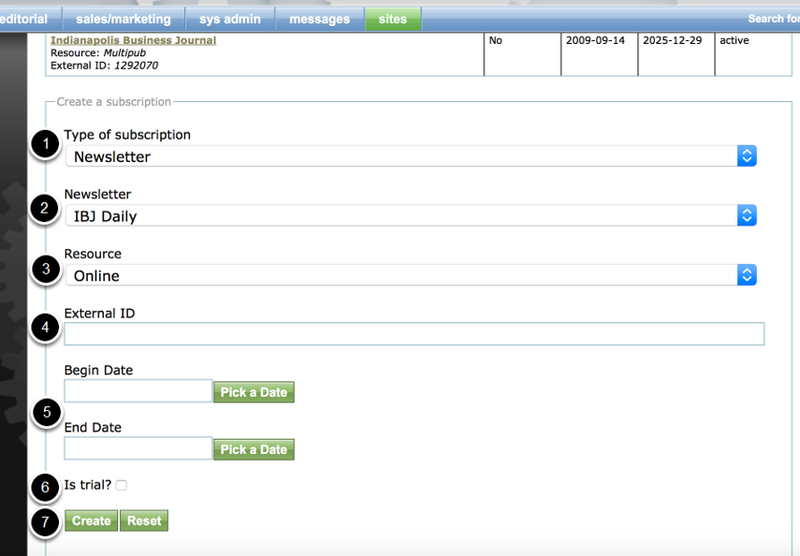 For example, if you select Newsletter (shown), all available Newsletters will appear in the dropdown. The Resource (3) dropdown references whether the subscription is online, print or online/print, depending on what's available on your website. All fields are required EXCEPT the External ID (4). The External ID should be used if your website is integrated with a third-party circulation system or a unified audience database. Put the ID number from that system for that reader in the External ID field. This will allow the systems to remain in sync. Zoom: Set up the subscription under the 'Create a subscription' section. Prev: How do I turn on or off the user registration email? Next: How do I change a reader's password?